Thanks to Philly's Mighty Bread Company, you can experience a small (batch) taste of heaven no matter where you are. From Country Sourdough, Walnut Raisin, Toasted Sesame and beyond, this is not your average supermarket loaf. Baked exclusively for club shipments, this is bread you'll pine for after the last slice is gone. It's bread you call your mom about. But what do you place on this life-changing, naturally-leavened bread? Our most popular and beloved spreads and jams, of course! Think Blood Orange & Grappa, Strawberry & Prosecco, Fig & Acacia, Pistacchiosa, Bacon Jam and more! Don't forget, all our clubs enjoy FREE Shipping! Each month, you or your loved one receives (2) loaves of freshly-baked bread plus a jam, condiment, spread or butter selected for that shipment. Crispy on the outside and so soft on the inside, this is simple, classic and delicious bread. Rustic and flavorful, there's nary a hint of that "sour" flavor that comes in a mass-produced sourdough bread. The flavors here are all natural and well-integrated. Perfect for sandwiches and toast. A classic favorite flavor, reinvented in loaf form. This delicious bread is best served toasted, or at least slightly warm, so the raisins will perfectly melt into the loaf. Slather with butter, crème fraiche or cream cheese, and top it all with some banana jam. Could this be the perfect jam? Composta di Fragole combines sweet, buttery strawberries with the tangy caramel flavors of balsamic vinegar, and, boy, if this isn’t a mutually beneficial relationship! Each component borrows from and lends to the other just what they need and have, emerging with a sweet-and-tangy, spreadable condiment that has no misuse except non-use. Try your hand at a gourmet grilled cheese with thin-sliced prosciutto, or a couple of slabs of country sourdough + strawberry balsamic and aged cheddar. 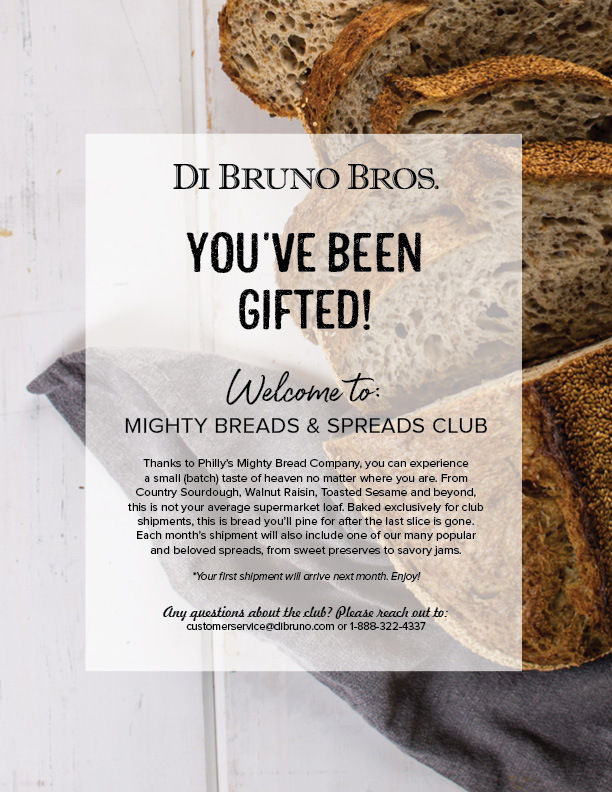 Our Breads & Spreads club ships within hours of baking. Prepare to immerse yourself in a deeper understanding of all things bready. We will send the recipient a welcome letter that includes your gift message the same day we receive the order. The first shipment will travel to your recipient the following month. Baked by experts, shipped for free! Philadelphia's Mighty Bread Company crafts small batch, naturally-leavened bread with big flavor. Using classic techniques and natural ingredients, they create a product that will absolutely delight your senses. Why is this club so great? There's one consistent question that takes hold once a loaf of Mighty Bread is gobbled up: When will there be more? Join the club and enjoy it on a regular basis!